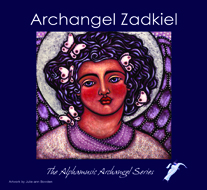 Zadkiel works with the high frequency spiritual energy known as the violet flame. Connect to him if you wish to transmute dense negative energy into positive energy, purify body, mind and soul, remove energy blocks and accelerate your spiritual development, transmute negative karma and heal past lives. Transmute negative energy arising from wars etc. Forgiveness is a great healer, without it negative energies such as anger, hatred and guilt will build up and cause health problems. Invoke Zadkiel if you are unable to forgive others or yourself, if you feel anger, hate, bitterness and resentment towards others, if you find it difficult to tolerate others, if you are unable to tolerate aspects of yourself, if you find it difficult being tactful.